At first glance, Massimo Sestini’s photograph Mare Nostrum is powerfully beautiful. Bright colours, a brilliant blue boat afloat the Mediterranean. My eye is drawn to one man: in what looks like a blue-and-white striped football jersey, he stands looking up at the camera with arms spread wide. But the boat is packed, tires hanging off the sides, and the open arms are those of a different kind of welcome. The helicopter carrying Sestini, and the Italian frigate coming to the aid of the 400-odd people aboard the cramped boat, are part of Operation Mare Nostrum (OMN), a search-and-rescue operation led by the Italian government with the help of the Red Cross and a number of NGOs. Mare Nostrum means “our sea”­—as in, we won’t let people keep dying trying to cross our sea, trying to escape to a better life. In its one year of operation (bridging 2013 and 2014), OMN saved over 150,000 people fleeing violence and persecution in Syria, and all across the African continent. 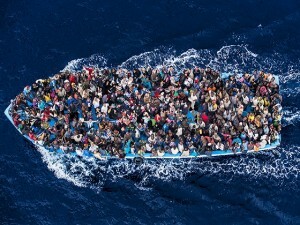 With those conflicts worsening, the number of people trying to cross the Mediterranean has continued to grow. It no longer represents a spike, but rather a larger exodus—one of many in an increasingly complicated and dangerous world. It’s time to examine these conflicts, these forced migrations. It’s time to help people establish new lives, new homes. It’s time for 6 Degrees.